Huge Prints for only $4! Michael and I were married eight years ago in the Arizona LDS temple. It’s such a beautiful place and is really special for our family. A while back I was looking for vintage maps of Mesa, AZ on eBay (we collect old maps of places we’ve lived) and I stumbled across this photo of the temple from the 60s. I loved how modern the shot is with all the white space! 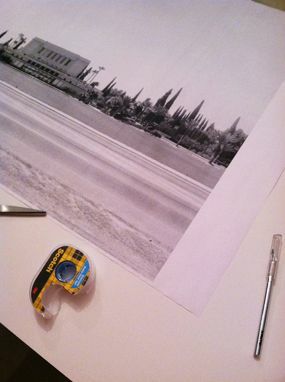 Later I saw this tutorial on Pinterest and knew I wanted to blow up my vintage photo for our home. I scanned in the photo and brought my zip drive to Kinkos (Or I guess it’s called Fedex Office now? Bor-ring!). 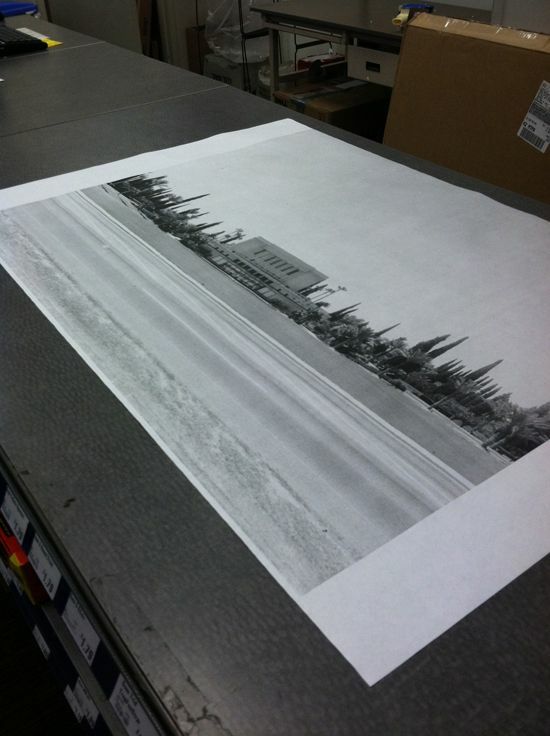 For only $4 they printed my image on their large format blueprint printer. The largest size you can do is 48″ wide, but mine is 36″. It’s so inexpensive because the paper is nothing special and you can only have black and white. But it’s huge and graphic and so affordable! I cut down the paper to size and then mounted the print with scrapbook tape on double thick foamboard I got at Blicks for $7 (which I also cut down to size using an X-acto knife). After mounting the print I realized I could save a ton of money by not framing it and just painting the edges. I used an orange tester paint that I already had on hand and a square-edged artist’s brush. It was easy to carefully paint just the edges of the foamboard. I hung the mounted print on the wall with my favorite picture hanging strips. I’m so happy with how this project turned out. I only wish my wall was bigger so I could have done the full 48″ width! From the side you get to see the pop of vermillion color. I love little surprises in design! Simply AMAZING! One of the best, easiest DIY I've recently seen! Beautiful! It really looks perfect there too! to think that it was only yesterday i wanted to ask how you would display church pictures! thanks so much..i love the orange surprise..just like the door you posted yesterday. can't wait to give it a go. BEAUTIFUL! Love the whole chest/lamp/accessories! Love your BLOG – you have a real talent for design. I'm LDS also. This is a great trick! Had no idea it's no longer Kinko's! Hey, that's a great idea. There are tons of awesome old photographs available to the public (Denver Public Library for one has an enormous online collection), and I love your idea of dressing up the edges with paint. Thanks for sharing! What did you use to mount the picture to the foam board? Love that! What a great DIY! 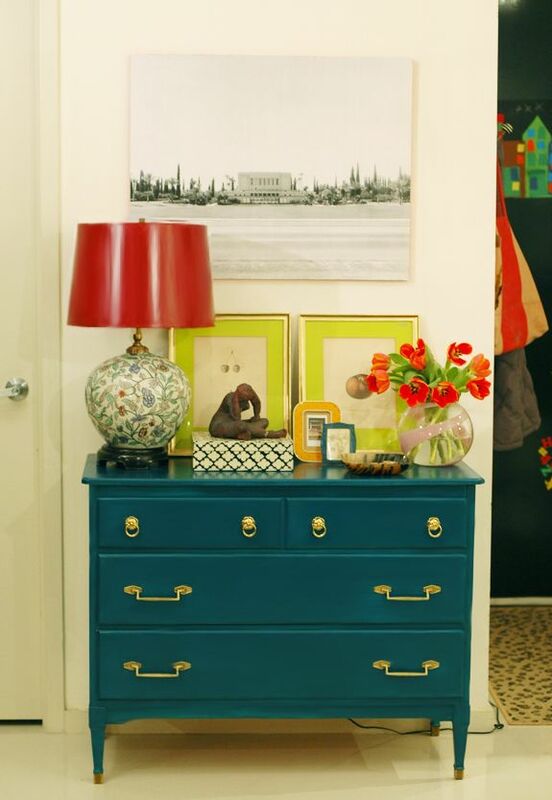 Love how it looks with the red lamp shade and teal chest too! You're awesome Jenny! This is the best DIY that I have seen in a long time. I love how affordable it is. The vermillion is lovely. I am thinking hard about what photo I would do this with. cool idea. I'm going to do this one. thank you so much for sharing! Incredible! I have to try this. Thanks for sharing!! This is so simple yet so meaningful. I love it! And your whole entry area is just perfect, too! I LOVE this. I have to pick a picture and try to tackle this one soon. Thanks so much for sharing! It looks great! I am totally distracted by that chest of drawers, though! Did you paint it yourself? What color is it? Love it! Huge art for $4, yes please. How great I love this! And I am also head over heels for that lamp! This looks great, and fits your spot just perfectly. The lamp, and chest, the whole works is so pretty and interesting. I might try this with the picture I have of me and my family in front of the Mount Timpanogos Temple. I think your brilliant! Thanks for sharing all your good ideas. Ahhh amazing! Can't believe it was only $4, it looks way more than that! You have a wonderful flair for color. And one of the best blog headers I have seen! Fabulous idea, Jenny! I love the statement of huge art pieces! Beautiful vignette, btw! Just saw this on Pinterest and linked over – awesomest photo of a temple EVER. Seriously. Did you use spray adhesive to stick it to the foam board? Love it! Love the pop of color on the edge, and I had no idea that prints could be had for so little. Thanks for sharing. love this! I always want to blow up some of my old photos. I usually end up being too hesitant because of the loss of quality. Did the photo have any problems being blown up or did it become extra grainy or pixelated? I can't really tell from the pictures on the blog. what a great idea! and I love the pop of color – so modern! This is such a cool idea!! I'm definitely going to try this. Absolutely love this!! Such a smart DIY and I love the pop of color on the sides. Bravo! 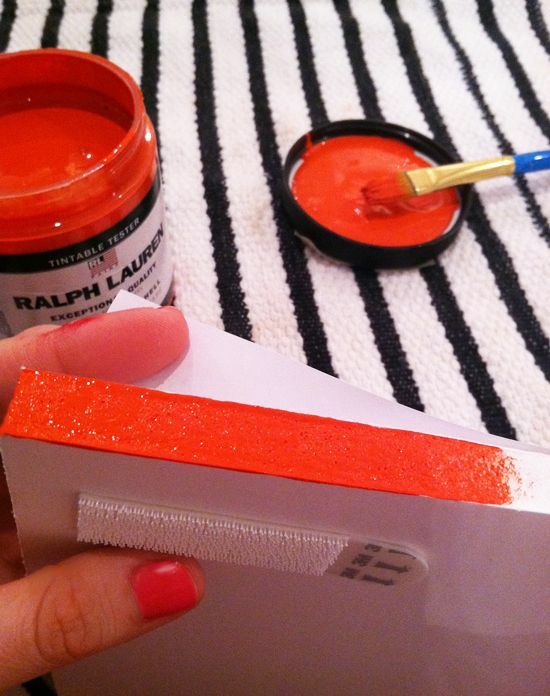 Adore this idea, and the orange painting on the edge is genius! 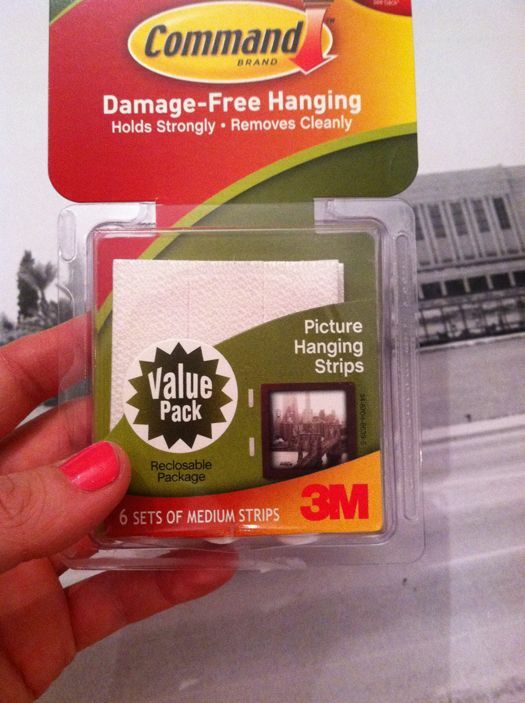 Those command strip photo hangers have become my new best friends, too. Can you say anything about the small peacock blue dresser the print is hung above? Did you paint it, and if so, with what? I LOVE that color. Love it! Great idea! I think I might have found my weekend project. The best diy I've seen in a long time!!! Love it. Amazeballs! And such an easy DIY. Thanks for sharing!! The AZ temple is by far my favorite, I love the style of it! You are brilliant, how do you think up these things. It looks so amazing! that's really cool; it looks great! Wow. I love this project!! Hoping I will have some good luck finding a similar photo of the Mesa temple, they are hard to come by! Thanks for sharing. 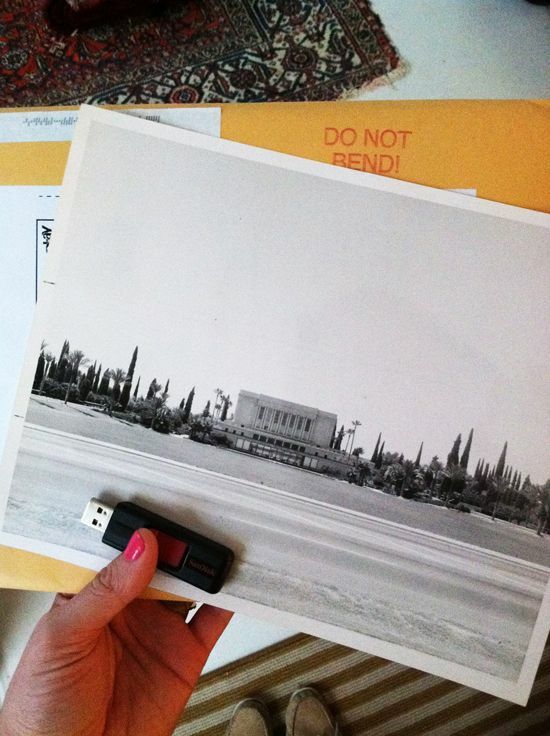 Would you be willing to share the scanned photo of the temple? It is just so great! What a great idea! I also adore that pretty black and white box on your entry table – could you tell me where you found it? 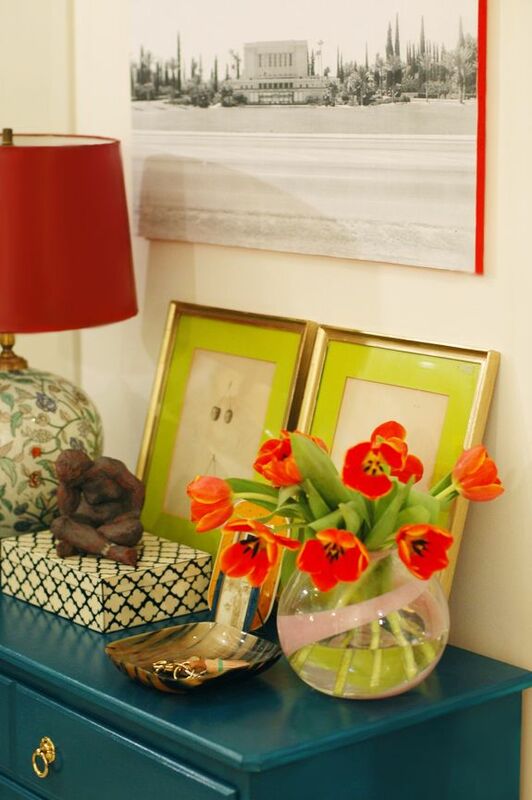 Oh, the color in the tulips picks up the edging of the print…and the green stems lock nicely with the green mats on the two frames….understated perfection! I love this! What a great idea. I have some photos I would love to try this DIY. Thanks for sharing. 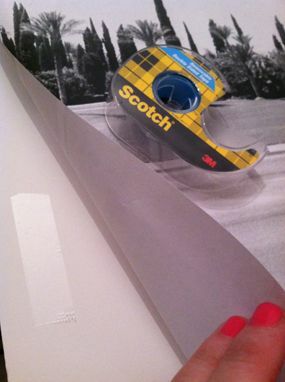 I did this same thing to a very large cheap poster that would cost 10 times the amount to frame it. Foam board is awesome! I love the pop of orange you chose and seriously your vignette on the dresser is stunning!! it looks great! i might have to make one myself. Love that you shared this! That is so cheap! And I'm also really interested in the results you find from your study. Just completed it and thought the questions were interesting. SO CUTE!!!! Thanks for the ideas! I love this look and have been trying to find a more mod way to hang one of our wedding prints. I'm doing this!